Photos are copyright ©Ray Smith, 1999, 2004 all rights reserved, and may not be reproduced without express written permission. Photos are protected by DigiMarc ® Digital Watermarks and will be detected on your web site if copied illegally. See http://www.digimarc.com for details on how the Digimarc MarcSpider ® image tracking technology works. 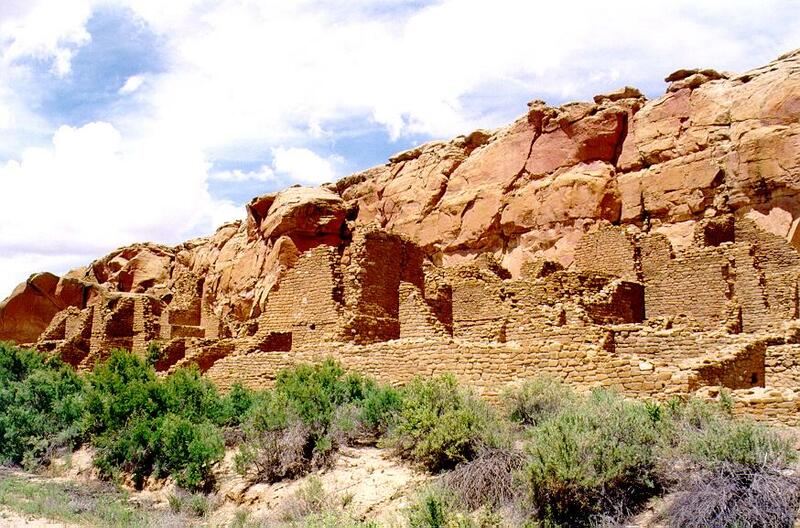 Known officially as "Chaco Cultural National Historical Park", this treasure of Anasazi history is located in the middle of nowhere. The number of visitors is intentionally kept low by the National Park Service by simply refusing to pave the two roads into the park. You must drive 23 miles (via the northern entrance) or 19 miles (via the southern entrance) on dirt roads to get to the park. I have included the Latitude and Longitude of various places so that you may find them easily if you use a GPS receiver. Keep in mind that because of Selective Availability (an error built into the GPS signals by the Department Of Defense to limit the accuracy of the data) the locations can be off by as much as 300 feet (100 meters) in both the horizontal and the vertical. Note that because the error varies, sometimes the location is accurate to within 15 feet (5 meters). Also note that the error constantly varies from 15 feet to 300 feet. From Bloomfield, New Mexico take New Mexico Route 44 south towards Cuba, New Mexico. Three miles east of Nageezi a sign marks the turn off for New Mexico route 7900 (N 36° 14.452' W 107° 42.392'). 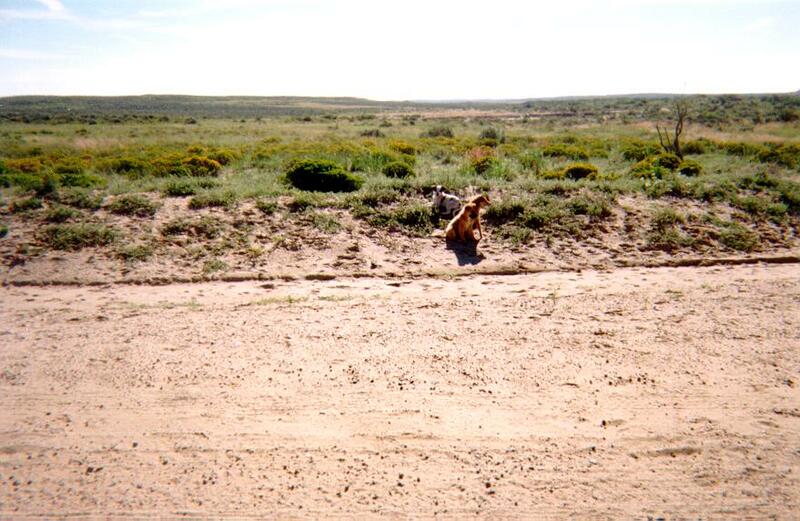 It is 12 miles to New Mexico route 7950 and the turn off is clearly marked (N 36° 10.465' W 107° 40.794'). 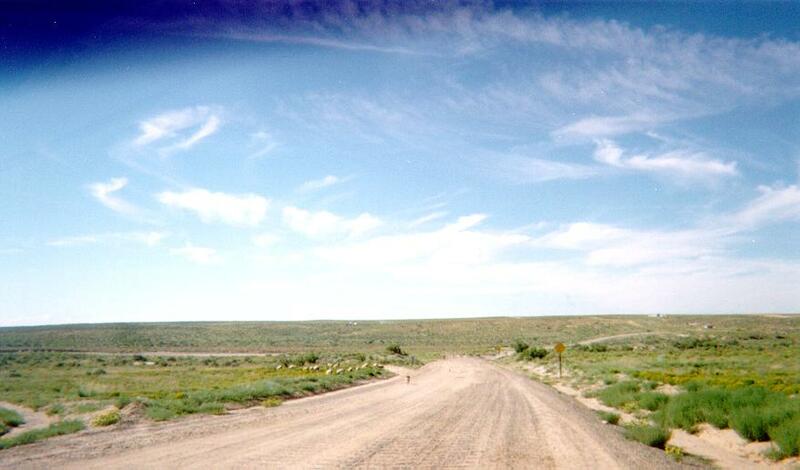 Continue to the junction of New Mexico route 7980 which enters the park and becomes paved. While there are a number of washboard sections, overall the road is in fairly good condition and can be driven in an ordinary passenger vehicle. The total distance from route 44 is 23 miles. From Crownpoint, New Mexico (on Navajo Nation land) take Navajo Route 9 (two miles north of Crownpoint) to New Mexico Route 57. This road, which is very rough and not recommended for low clearance vehicles, continues for 19.3 washboard miles. 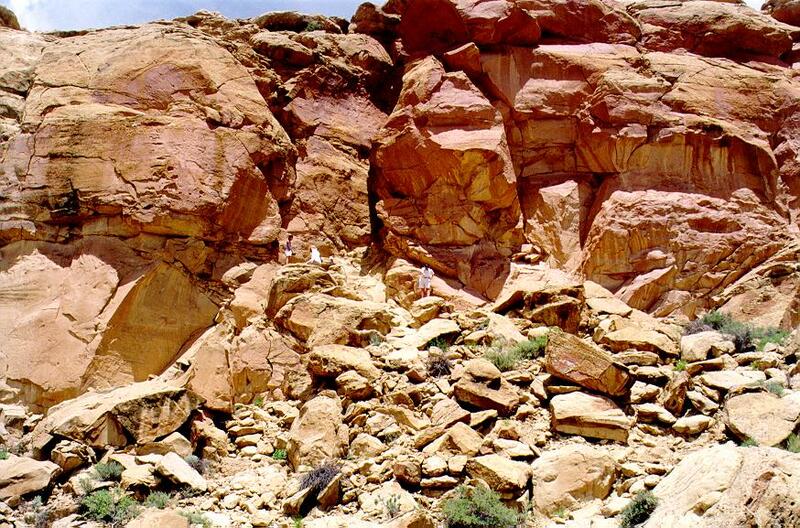 It enters the park near Fajada Butte and becomes paved. Note that this road becomes a morass when it rains, and the rainy season here occurs in the two months of July and August. The rain during this period comes primarily from airmass thunderstorms and can be quite violent and sudden. If there are clouds anywhere on the horizon, be alert when crossing washes for flash floods. Do not cross any wash that has water flowing in it. Call the vistor center at (505) 786-7014 to inquire about conditions. No lodging, gasoline, repair services, or food are available in the park. The nearest town is 60 miles away. Trading post (weekdays only) on New Mexico 44 are the closest places to buy staples. 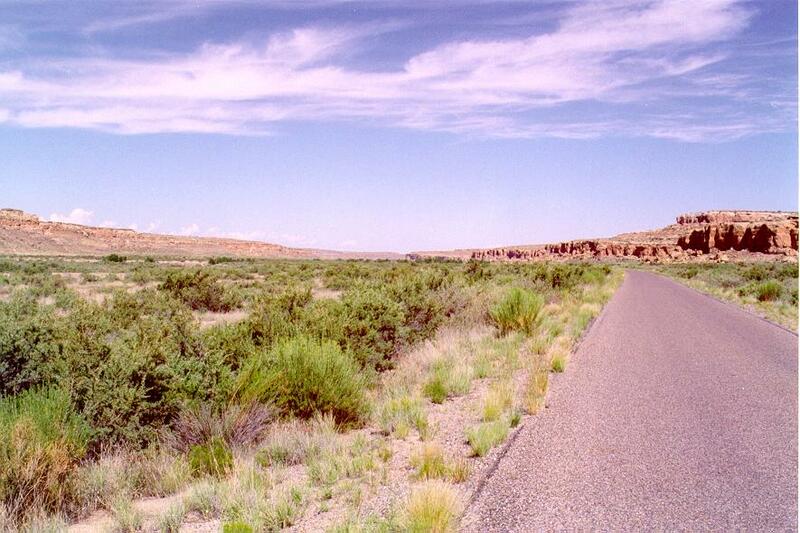 Highway 7950 heading towards Chaco Canyon National Historic Park. You can just make out a sheep dog in the middle of the road who came to investigate us. The road is in good shape with occasional washboard sections which jar the fillings in your teeth. The sheep dogs were on the lookout as we passed. 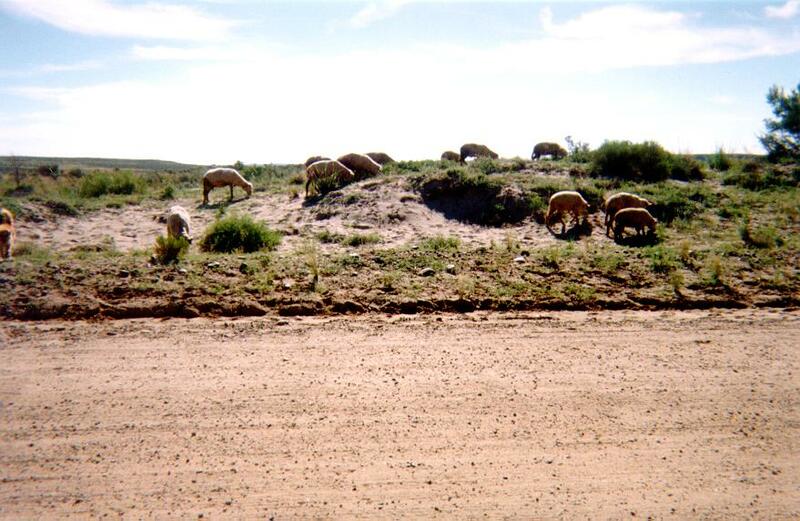 The road crosses the Navajo reservation and along this stretch you will see the occasional herd of sheep. Courtesy dictates that you slow down when nearing Navajo dwellings in order to avoid scaring the sheep and to keep the dust down. The road suddenly changes to a paved surface as you cross the park boundary. 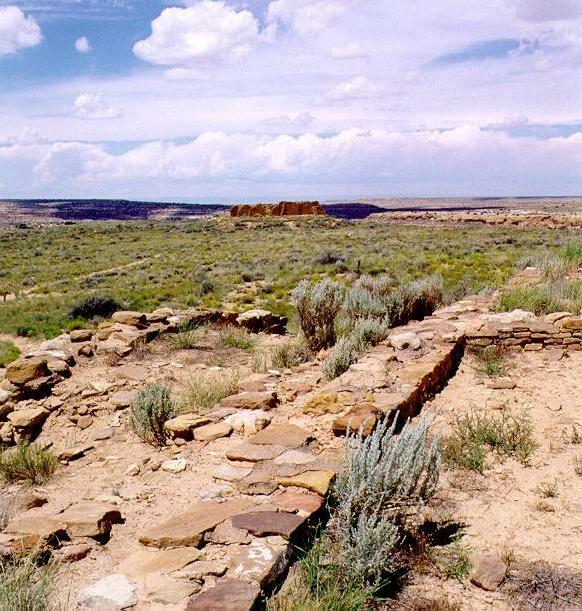 Here is the paved road in Chaco Canyon looking west. Your first stop should be the vistor center. 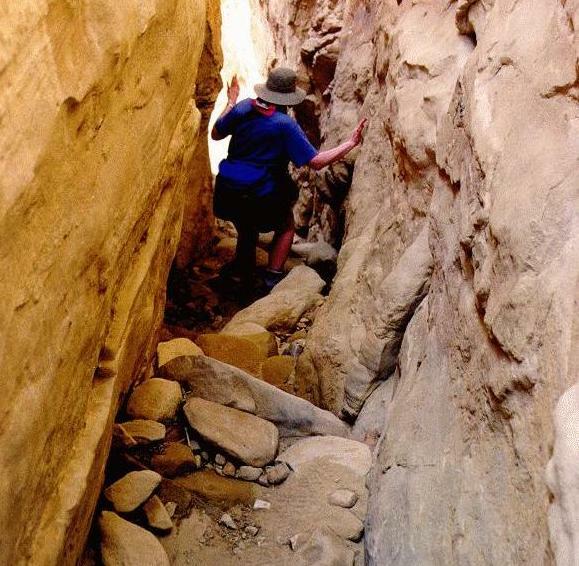 You can get a map of the canyon and obtain a permit to hike the backcountry, including the trail to Pueblo Alto which is a must do. 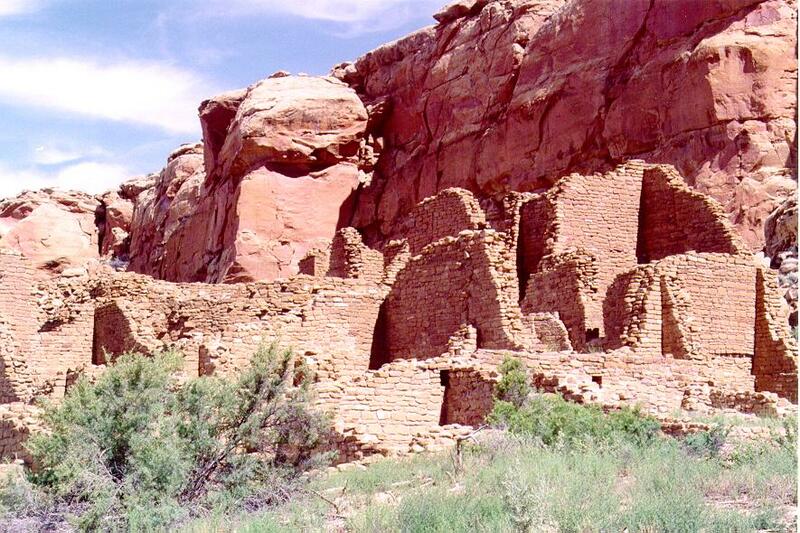 The offer a movie that takes about 45 minutes to watch and provides some perspective on the ruins and the Anasazi. In about the center of the canyon the road is intentionally blocked and you must walk a few hundred meters to the trail head for the Pueblo Alto/Canyon Overlook trail. 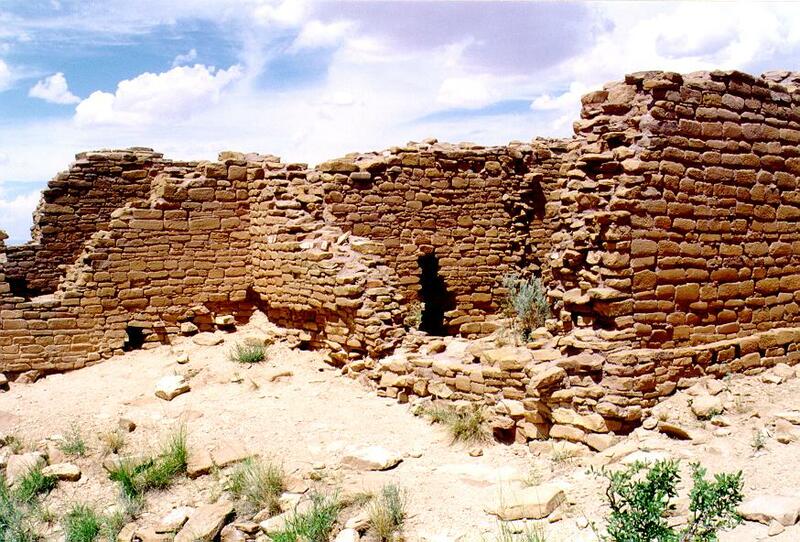 It is located behind Kin Kletso pueblo (from N 36° 03.880' W 107° 58.180'). 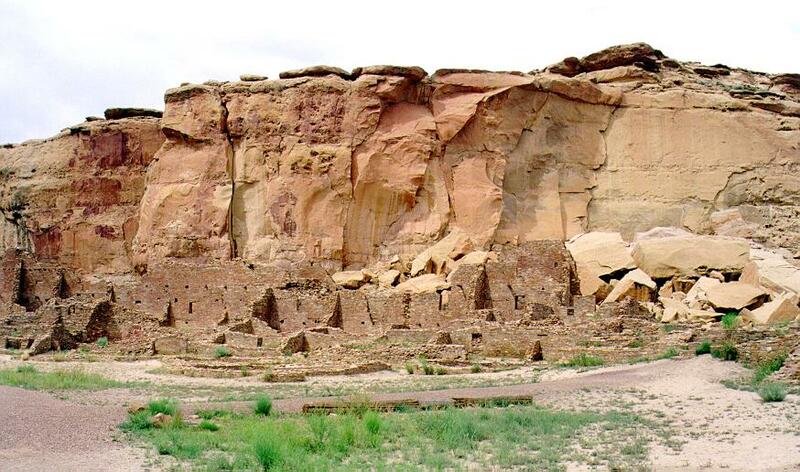 The Canyon overlook/Pueblo Alto trail climbs from about 6,179 feet on the floor of Chaco Canyon to about 6,500 feet at the ruins. 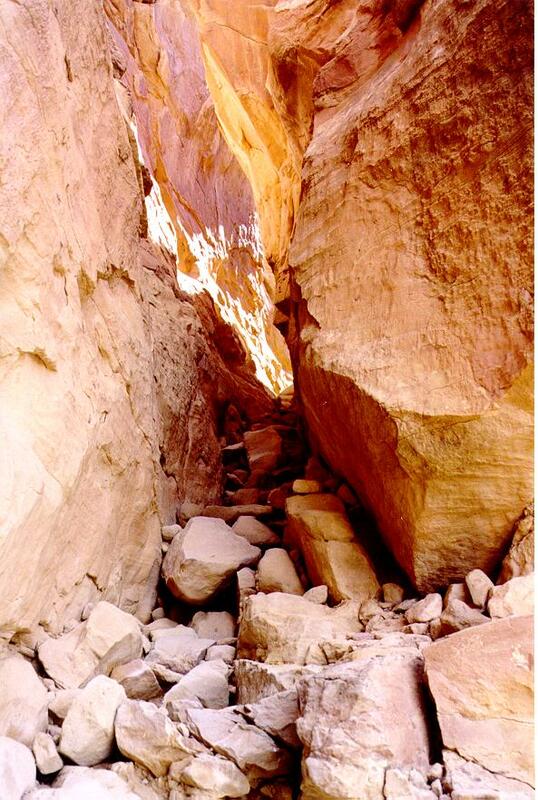 The trail starts in a cleft in the rock cliff at about N 36° 03.909' W 107° 58.228'. 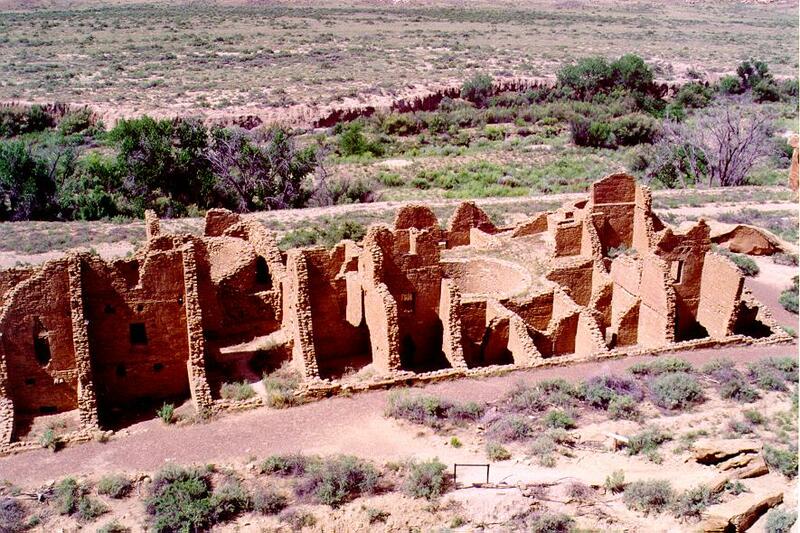 The majority of the elevation gained is here and you are rewarded almost immediately with spectacular views of the canyon and the ruins below. The trail crosses mostly solid rock and is therefore marked periodically with small rock cairns. The only shade on this trek can be found at N 36° 03.971' W 107° 57.561'. There is a large rock tilted on its side which offers shade in the hours before noon. The shade began to disappear after about 12:15PM on August 8, which should give you an idea of the sun angle. 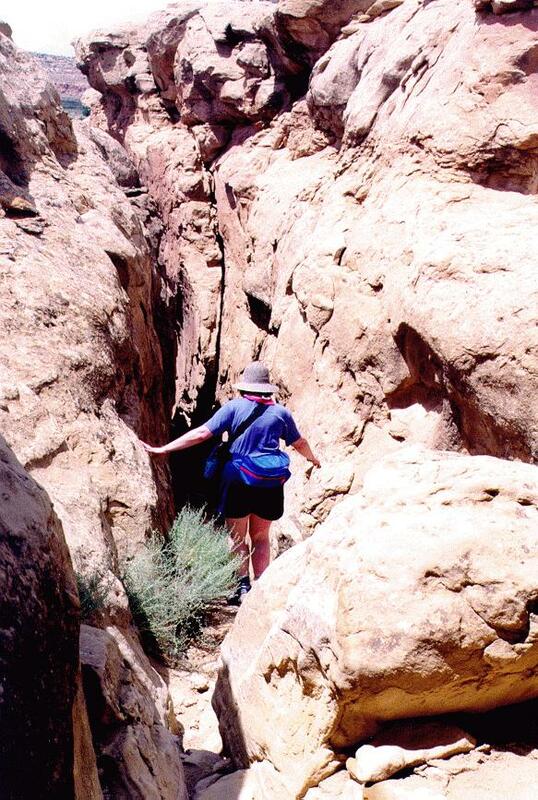 It is advisable to begin this hike early in the morning before the sun has a chance to heat the rocks. Bring lots of water. Kin Kletso from overlook trail showing the width of the canyon. 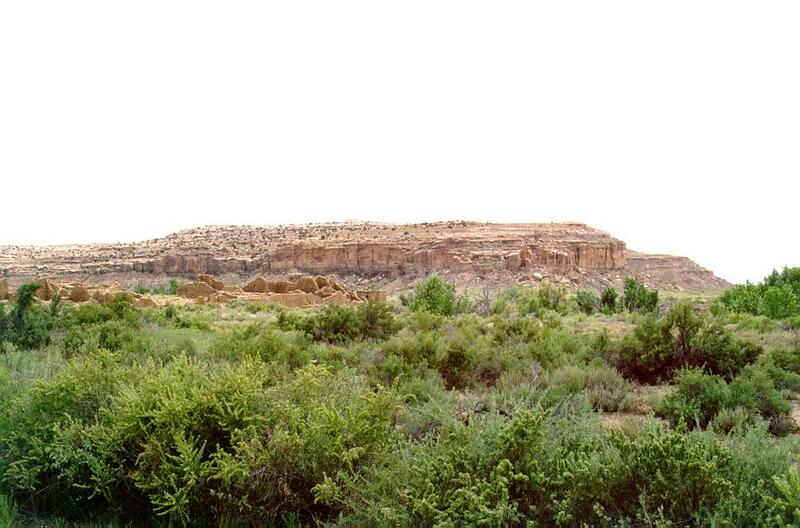 Kin Kletso from overlook trail with Chaco Wash in background. Pueblo Del Arroyo from overlook trail. Note the ramada which can be used for picnics. It offers shade which is a rare commodity in the canyon. You can see the gate which blocks the road and the parking area to the left. Pueblo Del Arroyo from overlook trail. 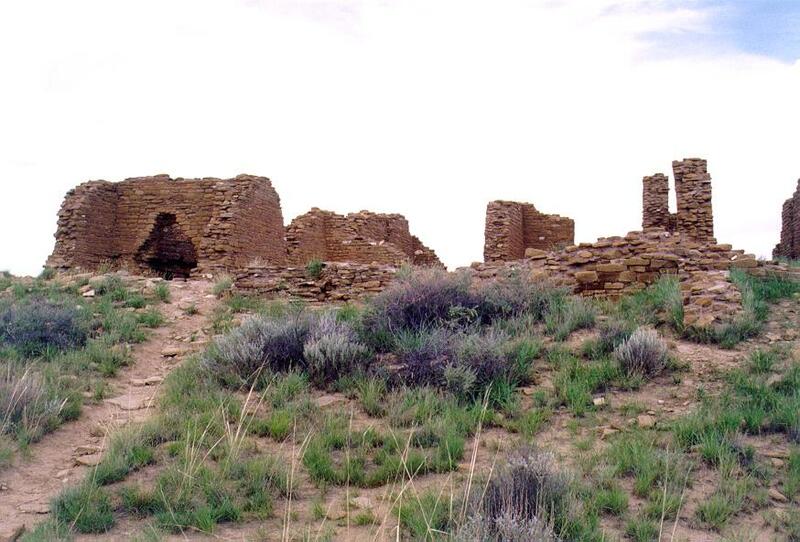 It is named Pueblo Arroyo because it is so close to Chaco Wash and "Arroyo" is Spanish for wash.
Pueblo Bonito from overlook trail. 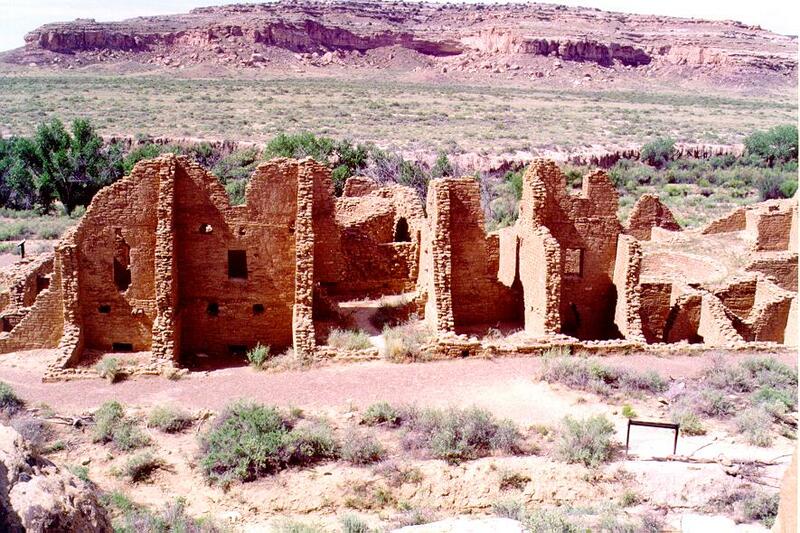 It is only from the overlook trail that the full size of Pueblo Bonito can be realized. 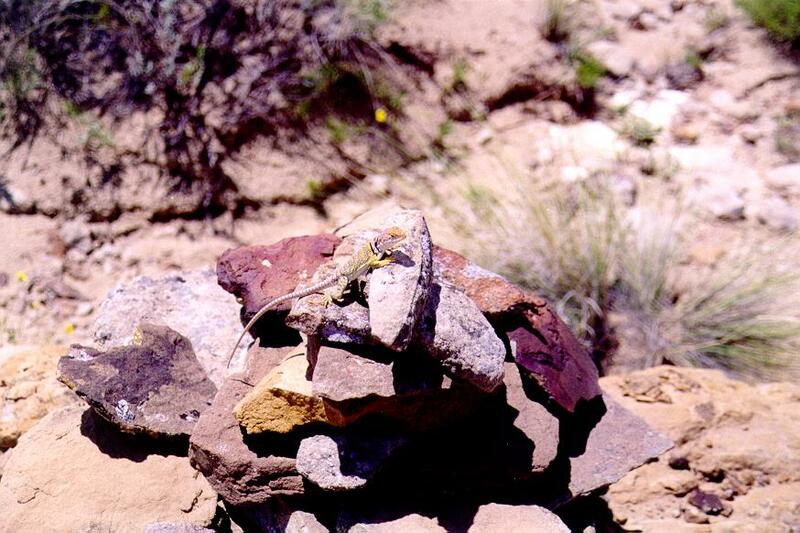 Closeup of Threatening Rock laying on Pueblo Bonito. This massive rock separated from the canyon wall and fell on the ruins in 1927. The National Park Service decided to leave it where it is. 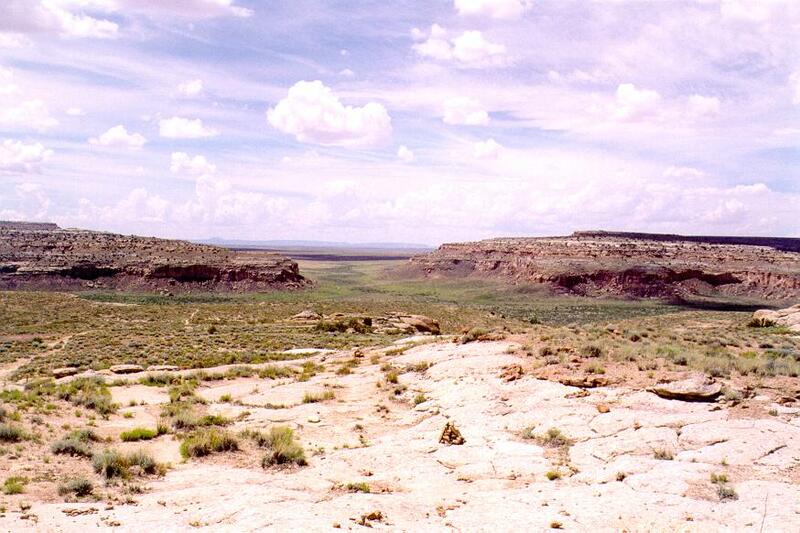 From the top of the mesa you get a excellent view of South Gap and the Chaco Valley. 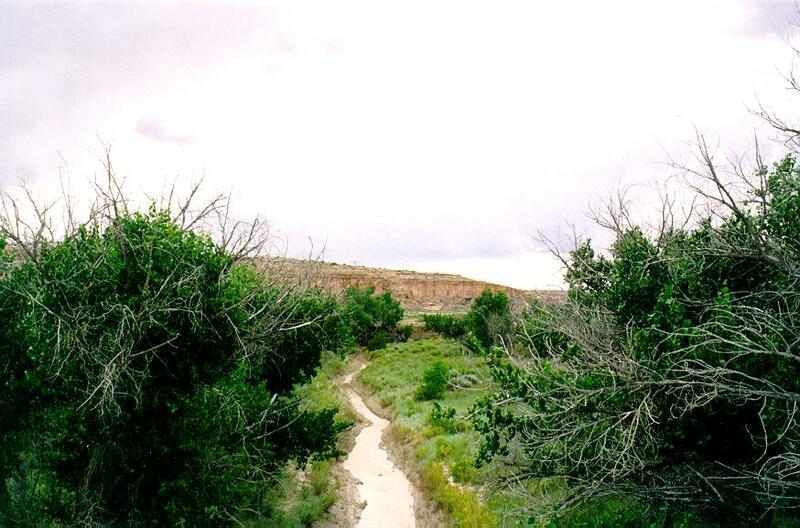 View of Pueblo Alto Trail about mid-way across the lower mesa. It started to get hot while we crossed this open stretch. The trail is visible here but is hard to follow when it crosses the numerous slickrock sections prior to this point. 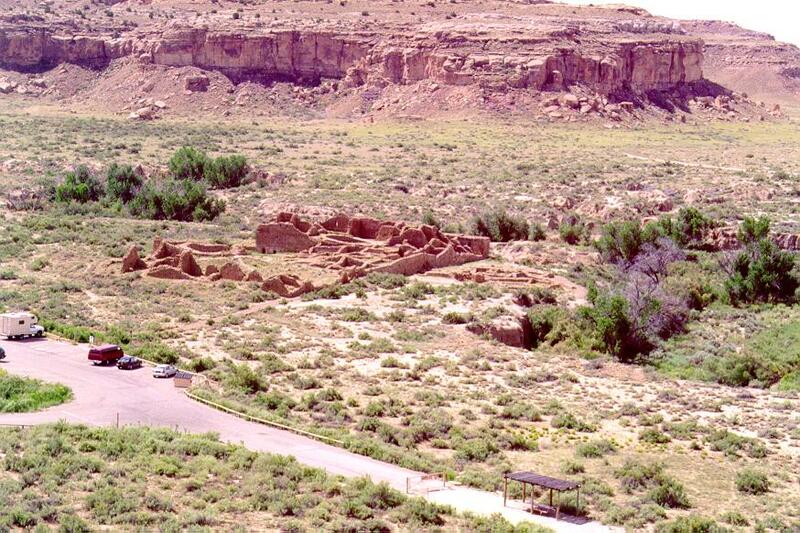 It is possible to view traces of the "roads" the Chacoans built. 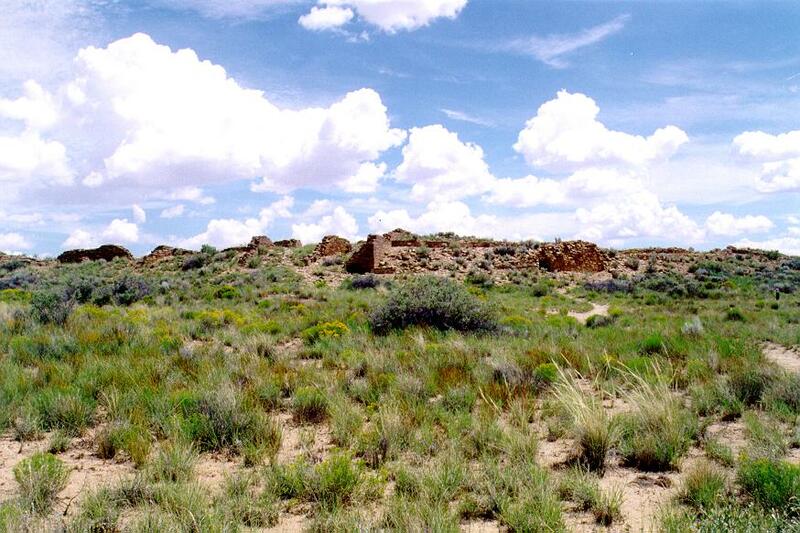 Specifically it is possible to see a trace of the "Northern Road" from Pueblo Alto. I like to think of these structures not as "roads" but as sidewalks. The hike up to this spot should convince anyone that walking over a prepared surface is easier than walking over broken ground. 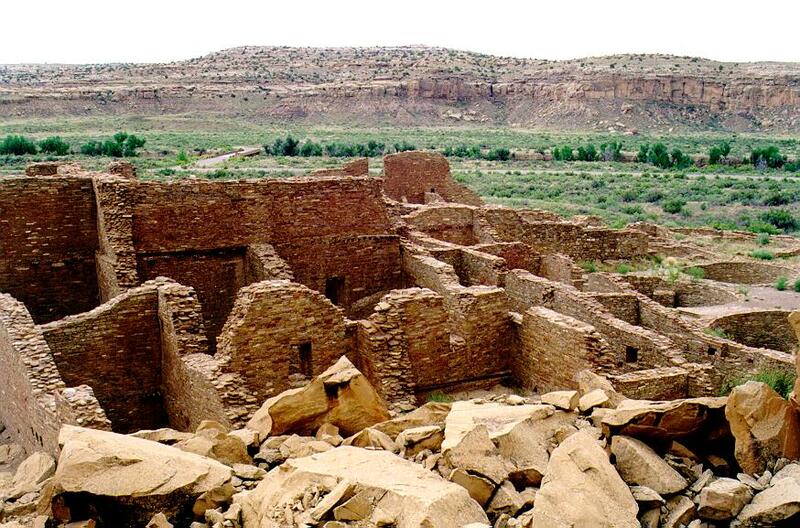 It would seem that the Chacoans, who carried large logs for pueblo construction from as far away as sixty miles, thought so too and decided to improve the routes to make walking as easy as possible. 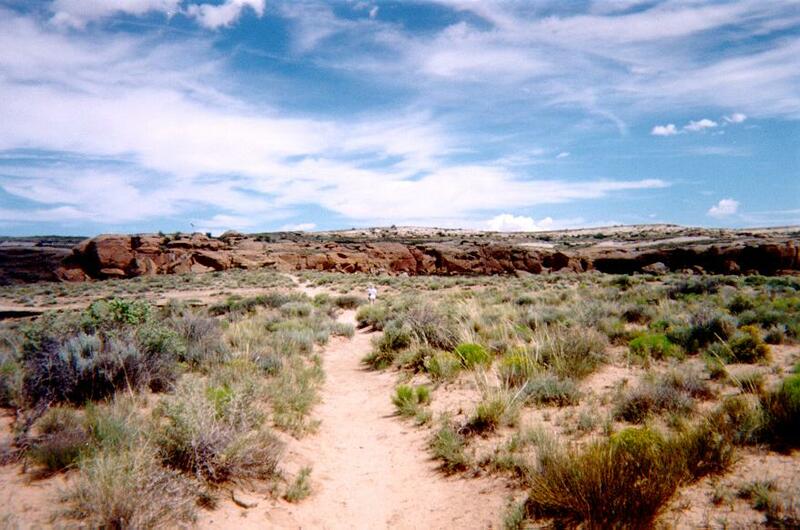 Pueblo Alto east: View of trail about 300 meters south of Pueblo Alto. New Alto from trail below. New Alto with Pueblo Alto wall in foreground. New Alto viewed from the trail leading to the ruin. New Alto from inside outer wall. View from New Alto room. Cleft in rock, starting down. Cleft in rock further down. 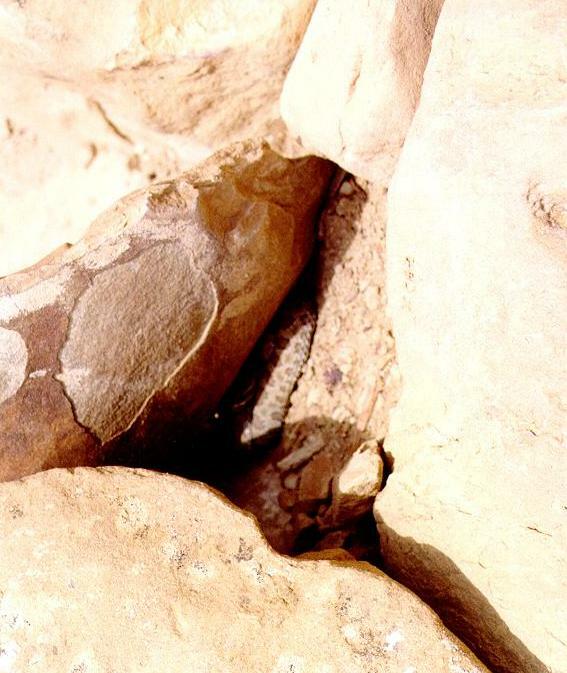 As we descended we noticed a snake curled up between some rocks. From a safe distance I took this photo of the snake on overlook trail. The start of the trail. Note the people. Pueblo Del Arroyo from ground level. Chaco Wash with flowing water. 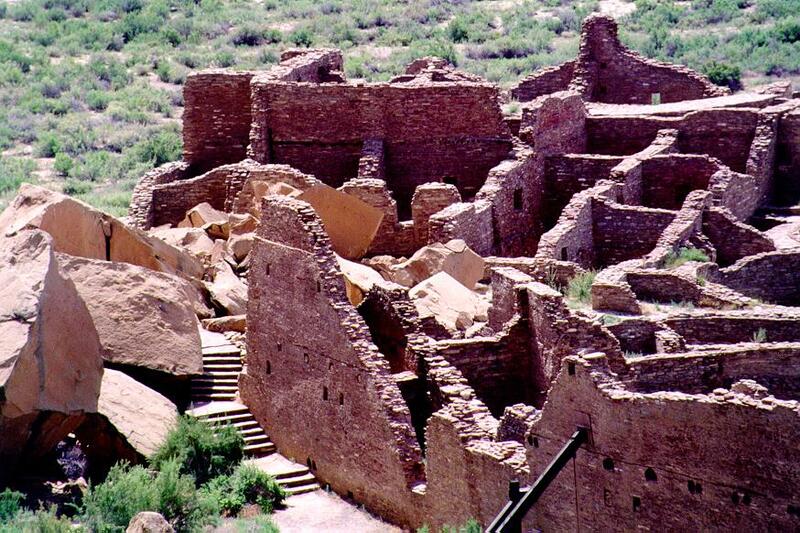 The most discussed ruin in the park is Pueblo Bonito ("pretty village"). 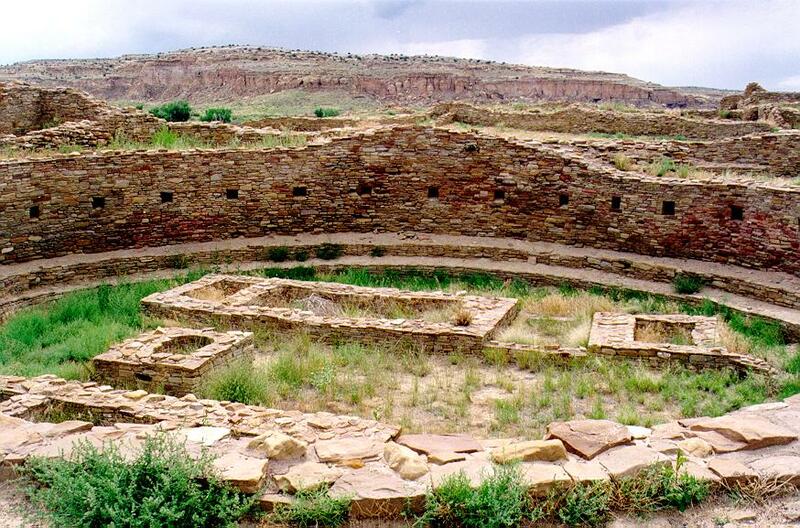 It is not the largest of the ruins (Chetro Ketl is) nor does it have the largest Kiva (Casa Rinconada has the largest), but it seems to be the favorite of archaeologists and public television producers alike. 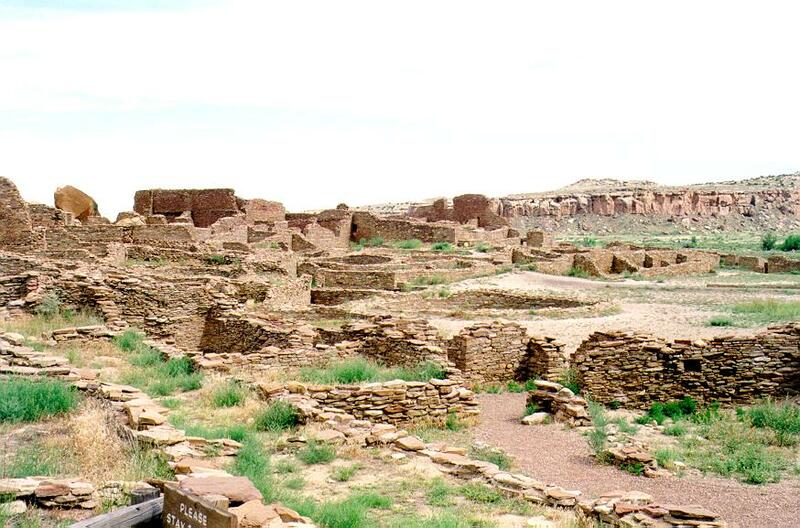 Originally thought to be simply an apartment building housing a thousand or so Chacoans, current guesses by archaeologists describe it as more of a warehouse and municipal building along with the de riguer religious and ceremonial connotations. The evidence for this theory comes from the fact that most of the rooms lacked firepits, meaning the occupants would have gotten very cold in the winter had the rooms been used for living. 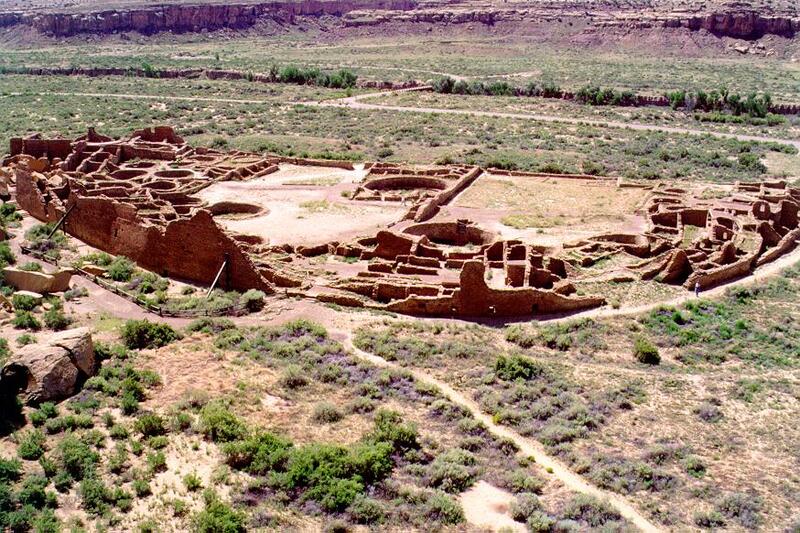 This fits in with the latest theory that Chaco was the center of a food distribution network that included the many Chacoan outliers as well as Mesa Verde and Aztec Ruins. Pueblo Bonito's 3rd addition. 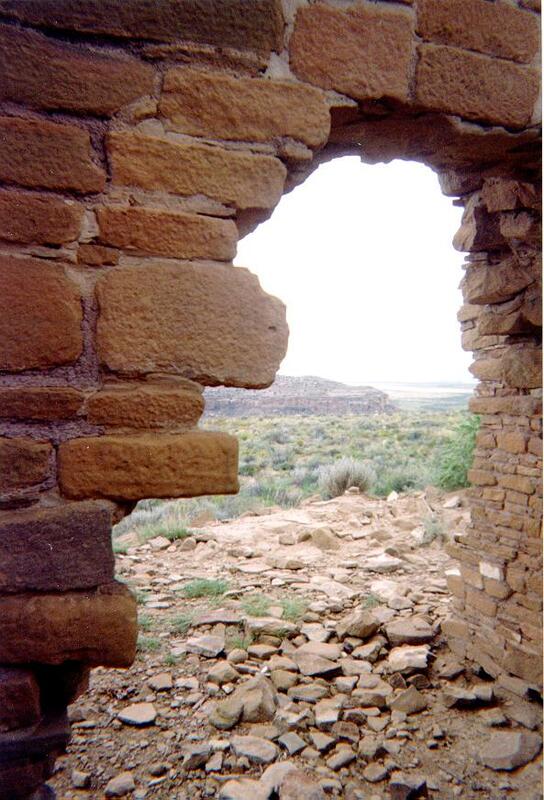 In the background is the bridge over Chaco Wash.
Pueblo Bonito. 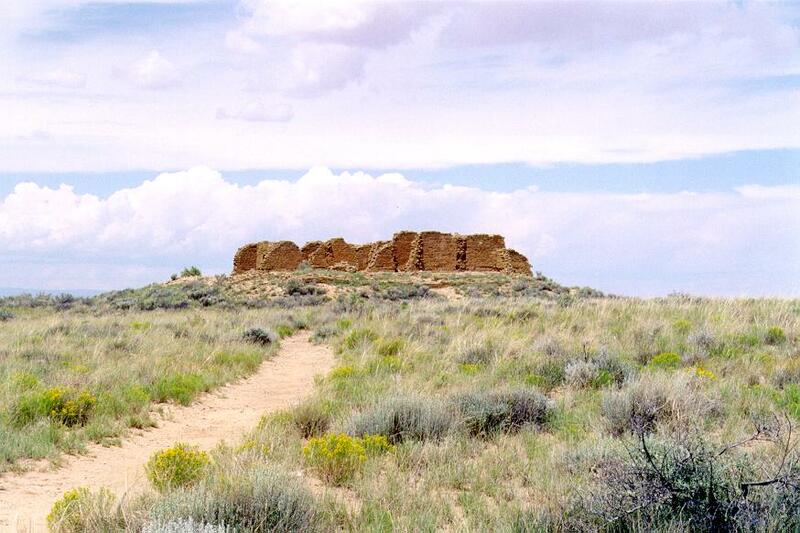 This photo was taken from the approximate center of the ruin looking southeast. Pueblo Bonito's main kiva. 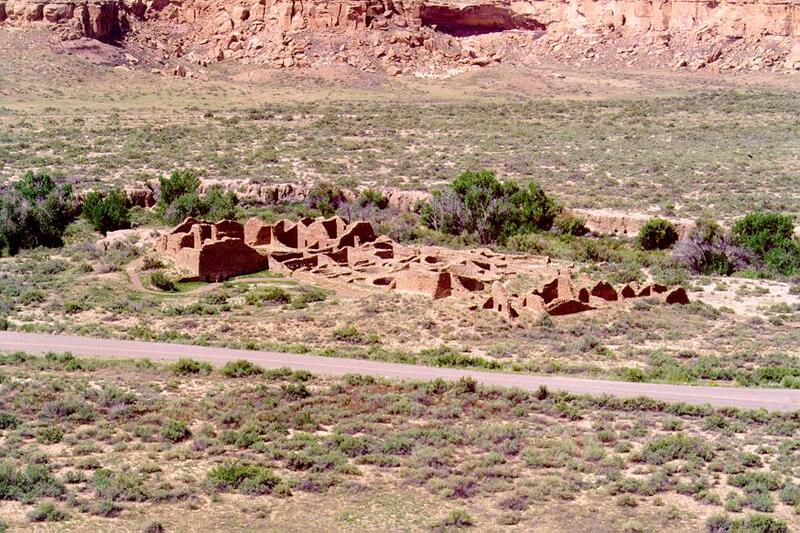 Earlier photos of this kiva, as well as the ruins as a whole, show that the grass was not permitted to grow as it is today. Apparently this is a new National Parks policy of allowing a natural look to the ruins. Pueblo Bonito's main entrance looking north. 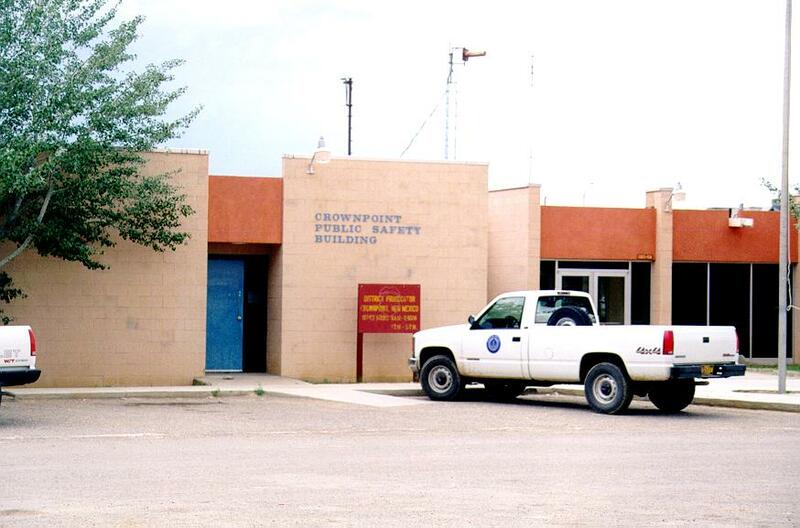 Crown Point Police Station. We half expected to see Jim Chee and Joe Leaphorn.